In my last Mixtape Episode, I included a couple songs from the early 1990’s and mentioned that it seems like hit songs from that era don’t get much radio play these days. The classics from the 80s are all over the place, and we’re seeing a revival of mid-late 90s pop culture…but for some reason, the radio hits of the first few years of the decade just aren’t as recognized. It kinda seems that as light and fluffy as we consider the music of the 80s, the music I jammed to in middle school, just a couple years before alternative rock and grunge took over our teenage consciousness, the pop music from 1990 through 1993ish was even more “throw away” than the decade that proceeded it. So I decided to specifically revisit that era for this Uncle Eddy’s Mixtape. 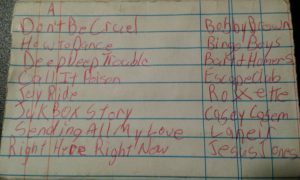 This was the time in my life when I was the most obsessed with the top 40 charts. I had kinda missed out on the “secular” radio during the last couple years of the 80s and heading into the 90’s… focused more on my taste for “oldies” and CCM. But somewhere in the middle of 1990, I decided to jump back into the current radio and the first thing I did was record songs from a top 40 countdown broadcast. I was initially confused by what I discovered that Sunday afternoon, after a church pot luck. It was Casey Kasem’s voice hosting the show, but he wasn’t calling it American Top 40… he kept saying “Casey’s Top 40”. What happened to AT40? But the important thing was that I caught the new number one hit song that day: a debut single by a new 20 year old singer named Mariah Carey. 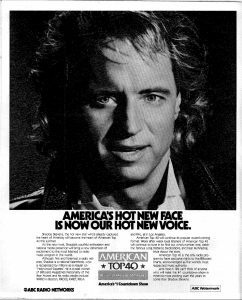 Before long, I learned that Casey had been replaced on American Top 40 with one Shadoe Stevens… whoever he was. It didn’t take me long to dig deep into both of those top 40 chart radio programs. Almost every weekend I was sitting by the radio on either Saturday Morning for American Top 40, (yup, this obsession even took priority over my cartoon watching), Saturday evening for Weekly Top 40 with Rick Dees, or Sunday afternoon/evening for Casey’s Top 40. I started going through all my old recorded cassettes…recording over many of them…which was a shame because I really miss the tapes I had recorded from the radio in the 80s. But the recorders I had in the 80’s were inferior to what I used by the early 90s…many of those tapes had been recorded by setting a stand alone tape recorder next to the radio’s speaker, capturing background noise along with whatever top 40 goodness I was trying to get on tape. I remember on one specific tape of the top hits of 1985, you could hear my dad lecturing me about my choice in music and how loudly I was singing along to the radio, (which you could also hear on the tape), saying “this is garbage” right in the middle of “Wake Me Up Before You Go Go”. So when I had access to an all-in-one radio and tape recorder unit, and eventually my uncle even let me use his dual cassette boom box which recorded IN STEREO, I thought it was best to record over all the old, bad sounding tapes. But what I wouldn’t give to have some of those old recordings back. So now, I have a bunch of tapes that were recorded from the radio between 1990 and 1992. 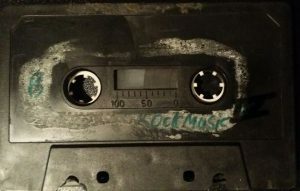 This particular tape, includes a few songs recorded from both American Top 40 and Casey’s Top 40, but it focuses more on songs broadcast on our local hit music station, 106.1 KSKU, out of Hutchinson, Kansas. That station was our main jam…it was always one of the strongest signals we could get here in McPherson, and it played exactly what we wanted to hear. 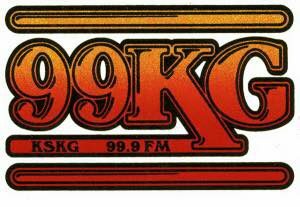 The other top 40 stations I frequented were 107.3 KKRD out of Wichita, (which I was banned from listening to at one point in the 80s… but that’s a different story), and Salinas 99KG. The tape starts off with a Bobby Brown song that’s actually from 1988… but then it ventures into a few songs from KSKU’s nightly Top 6 at 6:00 request countdown. It is interesting to note that although these songs received a lot of local requests, some of them failed to rank as highly on the national chart. Bingo Boys’ How to Dance peaked at #25 on Billboard’s Hot 100 (but it did hit the top of the American Dance Chart)…and The Escape Club’s (you might remember their “Wild Wild West” #1 hit) “Call It Poison” may have been the night’s #3 requested song, but it failed to break into the top 40 nationally. Another song featured on that night’s request countdown was “Deep Deep Trouble”, rapped by the cartoon character Bart Simpson. It seems easy to forget just how huge The Simpsons were in the early 90s… which is why it made sense for them to release a full CD album called The Simpsons Sing the Blues at that time. It’s interesting that after the album’s first radio song, “Do the Bartman”, which featured the King of Pop on background vocals, failed to chart in the U.S… because it wasn’t released as an official single here.. while it was a huge hit in other countries and did hit #11 on Billboard’s radio airplay chart… “Deep Deep Trouble” was released as a single, but the novelty must have worn off by that point because it only reached #69 on the Hot 100 singles chart. But the night’s #1 request also turned out to be a national #1 hit for Roxette. Although “Joyride” hit the top of the charts, it is may be the Swedish duo’s most overlooked hit, because they’re more known for their 80’s hit “The Look” and ballads like “It Must Have Been Love “and “Listen to Your Heart”. The rest of Side A of the tape seem to be recorded from a broadcast of Casey’s Top 40. First there’s Casey telling the history of the Jukebox. 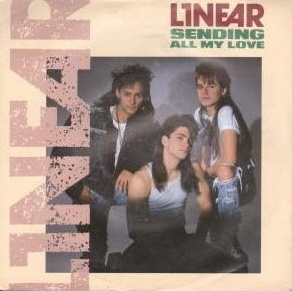 And then you catch the end of a request and dedication for Linear’s (just ignore the misspelling on the tape sleeve I made) 1990 hit “Sending All My Love”…a song that hit #5 on Billboard’s chart, yet we never hear it today. Then Jesus Jones finishes out side A with “Right Here Right Now”… a song that you do still hear played today. I always preferred their lesser hit, “Real Real Real”… but both songs are definitely more mainstream accessible than the rest of the almost industrial-sounding album. The hits that groups like Jesus Jones, C&C Music Factory, and EMF were able to have in 1991 show just how mainstream dance music was at the time… revealing a wide diversity and variety in the top 40 among the R&B, Hip Hop, “hair bands”, and even the beginnings of alternative acts like R.E.M. hitting the charts. But the cool thing about this little discrepency, is how it shows just how much my tastes changed between 1991 and 1992. Up to this point, all the songs on this tape have been pure top 40 hit radio bubblegum pop… the kind of stuff that ruled my middle school music appreciation. But a couple songs on Side B reveal where my tastes went after entering high school. The first song might be an LA Guns song that I have totally forgotten about over the years… but the next two songs… they kinda sorta helped change my life. As “It’s Over Now” fades out, U2 rolls in with opening guitar lick/chords of One, from their album Achtung Baby… which is immediately followed by a station promo/jingle overlayed over the opening of “Smells Like Teen Spirit”, Nirvana’s smash hit that smashed all mainstream music that had come before and opened us teenagers up to grunge, alternative, punk, college/modern rock, and so much other real rock and roll that we had missed as children of the 80’s. I know for a fact that I didn’t hear these songs for the first time as this was being recorded. Truth is… I barely remember ever hearing “Smells Like Teen Spirit” on the radio… and I tried to hear it on the radio when all my friends at school were talking about it before I got the chance to hear it for myself… (I had to borrow Nevermind on cassette from a friend and listen to the entire second side before I finally got to hear the song everybody had been raving about.) And I had already begun to appreciate U2, after hearing that some of the band members were Christians. But hearing those two songs, in the context of all these other songs recorded off the radio, reminds me of just how much my music listening shifted in such a short amount of time. In my mind, I remember these differing kinds of music as 2 totally different eras of my life… one was middle school and one was high school… but it’s crazy to think that one was early 1991 and the other was sometime in 1992, and just how much things had changed in that time. After U2 and Nirvana give us glimpses into what the rest of 90s rock music would bring us, we hear Miss KSKU DJ introduce The Outfield as a contestant in the station’s “hot or not” contest that asked the listeners to call in and determine if a new single/song was “hot” enough to become a hit. I’m not sure how the voting for “Closer To Me” went that night… but the song must not have really been that “hot” because, like some of the highly requested songs from the first side, it failed to make the top 40, peaking at Number 43 on Billboard’s Hot 100. Following The Outfield is the beginning of a song I had to use the Soundhound app on my phone to figure out… Atlantic Starr’s “Masterpiece”… which was a much bigger hit, peaking at number 3 in 1992. But the beautiful ballad is cut short… not sure why I would have cut the recording at that point… maybe I had to leave or shut the radio off for some reason… who knows… but I would rarely cut a song off in the middle when recording it… I would intentionally flip the tape over early to avoid having a song cut off by the end of the tape… and I got pretty good at being able to look at how much tape was left on the spool/reel to determine if I could fit a-whole-nother song on it before reaching that clear lead-in/out tape. After “Masterpiece” is interrupted, we hear Shadoe Stevens coming out of an AT40 flashback and then leading into Whitney Houston’s “All the Man I Need”. As Shadoe introduces the future number 1 hit, he mentions that Whitney would be singing the national anthem at the Super Bowl the following weekend… which would mean that this AT40 episode was for the weekend of January 19, 1991. Interestingly, I cut off the tape and didn’t record #21, which would have been The Outfield’s “For You”, after we just heard their 1992 single earlier on the tape. I probably cut that song and Whitney’s previous #1, I’m Your Baby Tonight because I had already recorded them in one of my other countdown recordings. By this point, it’s obvious the tape is back to the songlisting on the sleeve. Next comes a medley of hit songs produced by Arif Mardin… which I must have misheard because I spelled his name “Areth Martin” on the tape sleeve… hey, I was 13 years old. And then the tape closes out when I cut off the Arif Mardin produced “From A Distance” (thank goodness… I can’t stand Bette Midler’s singing) and instead capture Susanna Hoff’s (formerly of The Bangles) “My Side of the Bed”… which couldn’t have been from that same AT40 broadcast because it only peaked at #30…. so it must have been from a non-countdown portion of KSKU’s broadcast. I grew up in Salina and was a dedicated fan of 99KG. I’d love to hear some airchecks of that station if you have any. I did find an aircheck from 99KG from around ’87 on the internet a few years back…and I really enjoyed streaming it. I really wish I had downloaded it because it doesn’t seem to exist online anymore.